This weekend sees the students returning to Manchester and local kids giving up their summer jobs to head to other cities. It suddenly struck me that twenty years ago I was also starting at University of Manchester, for my M.A. in novel writing. In truth, I'd been prompted to memory by the documentaries about Princess Diana's death. I'd left my job in Croydon the previous week, with a short break before starting at University. My dad had taken almost all my stuff back up, leaving me with just a suitcase for my final week in London in a now spartan bedsit. I'd woke up on the Sunday morning to be told that Princess Diana had died in a car crash in Paris. "Oh, really?" I probably said, and rolled over and back to sleep. Diana was only a vague presence to me in 1997 - she'd left royal life, and all the soap opera that came with her marriage breakdown. I'd never had much time for her, but had a vague respect that she'd done some good work recently around land mines and AIDS; but tabloid Diana, with the tacky boyfriends and paparazzi followers was something that had passed me by. I'd been living in London for a year, and I'm pretty sure she'd not been a presence in the city during that time - the dog days of John Major's failed minority government and the triumphalism of Tony Blair's electoral landslide. At the same time I was listening to an eclectic mix of music - the Britpop overflow of rubbish like Stereophonics etc. that came along in the wake of Oasis's regal success and overbloated third album "Be Here Now" only just giving way to the more cerebral pleasures of Belle and Sebastian, Spiritualized, the Verve and Radiohead. I'd write about a lot of this - music, politics, art - in the novel I was beginning to think about. I went back to London for a week, and the indifference to Diana was hard to hold, given the hysteria that took hold of the country during that week. Alone in my bedsit I found myself drawn to the rolling coverage and even to some extent drawn in. On the morning of the funeral I meant to get up early and join the throngs on the Mall, but then I must have stayed up late, overslept, and watched it on television - or more likely saying my goodbyes to the city that had been my home for just less than a year, glad to be returning to Manchester. Before I decided to go back to college I'd been seriously writing for several years. The old "bottom drawer" novel had been followed by one that I'd written in Manchester in 1994-5 in between the day job, called "Lineage" which got shortlisted for the Lichfield prize, the first time anyone outside of friends and family had given me any approval. Until then, I didn't know if what I was doing was "real" writing, or, like my music, I was just an enthusiastic amateur. Going down to London I'd at least met a few writers and other creatives. There were a group of poets who used to meet up in a pub in Brixton, scabbing drinks, and not, as far I could see, writing all that much. There was the odd journalist or novelist I'd meet at a party, either rich, drunk, debauched or more often than not a combination of the three. In London I'd tried to begin a literary life: I'd had a few things published, a few poems in little magazines, whose titles I noted down when I visited the poetry library. Who knew that Smiths Knoll, the Frogmore Papers, the Rialto, Other Poetry, Iota, Fire et al, were where the action was happening? At the same time I was visiting art fairs at Exmouth Market, foolishly failing to buy Tracey Emin postcards as the YBA ship began to sail. I attended a poetry group once or twice at the local library but the room - or the poets, it was hard to tell - smelt of wee, and I didn't go back. I also started a quirky magazine called "Bananas from the Windward Islands". Quirky because I didn't put the poet's names on the pages of the poems, as I wanted them to speak for themselves. I got it photocopied at a local print shop. Somehow I also got involved in a letter exchange with a woman who asked for contributions which she'd then photocopy and then send round to the others in the exchange. None of this was particularly satisfying, and I wrote another novel, and started a further one, in the long evenings, after a boring day at a hated job. At some point I applied to the UEA and had an interview where Andrew Motion, his painkillers wearing off after a long day interviewing me, didn't exactly show much interest in my prose (which I was there for) or my poetry (which I wasn't.) The other writers being interviewed that day were literally the first novelists I'd ever met - but several had already had their books published so I was "competing" if that's the right word, with a disadvantage. No matter, when I applied for the M.A. at Manchester with a short story, I was informed before I left "don't worry, you're on the course" - which was a good job since I'd already handed my notice in. So twenty years ago I'd downsized to a student house - with three other post-grads, on the edge of the notorious Nell Lane estate in Chorlton - and was about to change my life. Whether it stayed changed is another matter, twenty years on, still working the 9-to-5 in a more interesting but none arty job; with a chequered history of publications and readings behind me; but with a good proportion of my friends now being creatives of one sort or another. Though I was twenty thousand words into a noirish futurama called "Sleeping Next to God", I was advised to start something new. I thought I'd begun the novel which would become "High Wire" on the computer but a few years ago found a first few pages in a neat longhand. 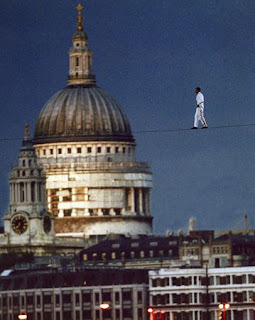 That novel was set in London - beginning on election night 1997, and ended several months later with the Thames Festival where the tightrope walkers Didier Paquette and Jade Kindar Martin crossed over the Thames in mid air. I'm guessing had it been published than any sequel could well have started with Princess Diana's death and funeral. That tightrope walk would at least give me novel its title. Around this time I caught a taxi in for my first day at college, as I wasn't sure which buses went and I was running late. I queued up and met one or two of my future friends and fellow students. I must have met the tutors Michael Schmidt and Richard Francis (the latter having interviewed me) shortly afterwards. So everything had changed, and maybe if my life since then my life has bounced back into a more familiar shape; the life of letters never really presenting itself; then so be it; I'm still writing.